One of my favorite pieces in this exhibition is Ford’s photograph The Whale Shark Tank. This photo is taken in the largest aquarium in the world, which is located in Atlanta, Georgia. The photograph portrays the South as a place that has invested in new and grand facilities to provide entertainment for their community. At first you could almost believe that this picture was taken under the sea because of all the ocean life that’s captured in it. The lighting in the tank makes the photograph look more magical. The light looks as if it is sunshine reflecting through the water and it makes the whale shark and the fish surrounding stand out more. here is a little boy in the photograph who looks like he is taking a picture of the whale shark. I like that Ford captured the boy to show the size comparison to the whale shark. It’s astounding to think that one of the largest fish species in the world exists in this tank and you can go see it. 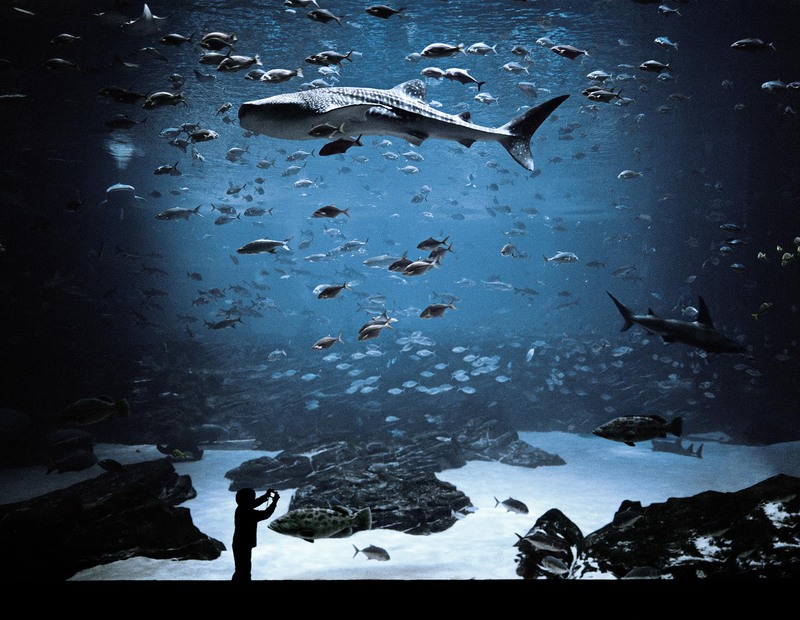 I have been to this aquarium and seen the whale shark and it was an incredible experience. This photograph represents how we can explore nature because there are places like this to be able to. We are curious human beings who want to discover new things. We are lucky to be able to witness and learn more about nature trough facilities such as aquariums and zoos. image: Kyle Ford, The Whale Shark Tank, Atlanta, Georgia, 2008. From the Second Nature series.